The following article is reproduced from American Breweriana Journal by permission of the author, John Medkeff. The story is excerpted from John's upcoming book on Delaware's breweries. He can be contacted at MEDKEFF@prodigy.net. Early failures in Delaware make Stoeckle family industry leaders. Although Wilmington, Delaware, has never been known as a brewing industry center, the history of suds in the First State's only big ciry is a long and storied one. Beginning with the arrival of Swedish settlers in 1638, the brewing of beer was done primarily in homes. This tradition continued with the later settlements of Dutch and English right up until the time of the Civil War. William Shipley, one of Wilmington's founding fathers, built the town's frst small commercial brewery in 1734. Shipley's brewery outlasted its founder, producing beer for nearly a century. In the late 1700s and early 1800s, tavern and saloon keepers -- mostly of English and German descent -- began brewing beer for their patrons. It was not until after the Civil War that brewing became big business in Wilmington. The relatively small size and location of the ciry, situated between industry leaders in Philadelphia and Baltimore, would prohibit Wilmington's three large brewers from ever seriously competing in larger markets beyond the Delmarva peninsula. In fact, the argument could be made that the city's three large commercial breweries were able to flourish from the 1880s until Prohibition because of the city's tremendous population explosion, which was fueled by the industrial revolution and led by two cultures steeped in the tradition of beer -- the Irish and Germans. Of the 19th century German immigrants that called Wilmington their home, few would become as successful in business and respected in the community as brewer Joseph Stoeckle. Born in Bachau, Wurtemberg, Germany in 1834, Stoeckle immigrated to America in May 1854, settling in the then bustling town of Wilmington. By 1856, Stoeckle and his wife had amassed enough money to open their own saloon at 202 Tatnall Street. In two short years, the couple's venture was such a success that they were able to move their business to more pretentious quarters at 225 King Street. They operated their popular hotel and saloon at this site for the next three decades. The origin of the great Diamond State Brewery began in 1859 when Joseph Stoeckle learned the art of brewing from his brother in law Gebhard Mutschler. The two began brewing lager beer for Stoeckle's patrons in a small brewery that they constructed in the rear of the saloon. The annual capacity of Stoeckle's first brewery amounted to only about 2,000 barrels. The brewery ceased operations a little more than a year later, when Stoeckle became ill. Despite the economic malaise caused by the Civil War, Stoeckle's saloon and hotel managed to survive and, indeed, thrive throughout the period. About the same time across town, three enterprising young brothers had established Wilmington's first large commercial brewery on the corner of 5th and Morrow Streets, just west of Adams. Aquilla, George, and Samuel A. Nebeker purchased an abandoned quarry at the site and, after excavating for lagering vaults, they built a rather substantial plant. S.A. Nebeker and Company opened for business in 1859. The brothers foray into the brewing business was to be short-lived. As was the case with many small breweries during the era of the Civil War and immediately after, the Nebekers simply could not compete with their larger, more expertly managed competitors. Most of the competition at that time came either from Philadelphia breweries or the newly formed Wilmington concern, operated by John Hartmann and John Fehrenbach. By 1871, the Nebeker brewery was no longer operating. Immediately following the dissolution of the Nebeker brewery, another newly-formed interest purchased the property with the intent of producing lager beer. A. Bickta and Company was organized in 1872 by Wilmington business owners Augustus Bickta, Francis Bickta, James Clark, Edward J. McManus, James Murphy and Joseph Stoeckle. The enthusiastic new firm greatly enlarged and improved upon the former Nebeker facility, fitting it with all of the modern brewing appliances of the day and naming it the Diamond State Brewery. A. Biekta and Company was to suffer the same fate as their predecessor and for the same reasons. In the firm's short two-year existence, they were never able to increase their business or exceed 4,000 barrels total output. By comparison, the largest Philadelphia breweries of the day were quite capable of producing more than 100,000 barrels a year. After the company's demise in 1874, Joseph Stoeckle and Frank Bickta bought out their partners interests and decided to continue on their own. Three weeks after the formation of his new partnership with Stoeckle, Frank Bickta died suddenly and the business was dissolved. The struggling Diamond State Brewery then came once and for all under the sole ownership of Stoeckle, who in later years would prove so successful that his very name would become synonymous with beer throughout the Delmarva peninsula. Under Joseph Stoeckle's direction, the brewery experienced a moderate but continual degree of success throughout the remainder of the 1870s. By 1878, the Diamond State Brewery was Delaware's leading producer of beer, turning out 3,880 barrels that year and eclipsing the sales of its chief local competitor, Hartmann and Fehrenbach. Stoeckle's firm managed to increase production to 4,555 barrels the very next year. Although the Diamond State Brewery was obviously well positioned as the 1880s began, one formidable and unforeseen obstacle lay just ahead. On the evening of October 29, 1881, a raging fire destroyed nearly the entire brewery. Not to be deterred, Stoeckle recouped $25,000 from two fire insurance policies, though, and rebuilt a much larger and better-equipped brewery by the end of 1882. Occupying three quarters of the block bounding 4th, 5th, Adams and Jackson Streets, Stoeckle's new brewery was so modern that it was frequented by visitors who contemplated building similar structures elsewhere in the country. The all brick complex consisted of a brew house, an engine house, several cold storage houses, a cooper shop and horse stables. The brewery proper was a stylish five-storied structure with massive lines common to late nineteenth century breweries. It was surmounted by a large tower and had a second story alcove adorned with a nine foot statue of King Gambrinus, the legendary monarch credited with having begun the brewing of beer. Over the next 80 years, Stoeckle's statue became a popular Wilmington landmark and the very symbol of his brewery. Joseph Stoeckle's only son, Harry J., entered the family business after graduating from high school in 1882. Under his father's tutelage, Harry received a practical education and training in the brewing industry. He proved to be an attentive, industrious and faithful student. It soon became apparent that the junior Stoeckle had inherited his father's good business sense and desire to succeed. Throughout the remainder of the 1880s and into the early 1890s, business was increasingly more prosperous for the Diamond State Brewery. These years saw an increase in sales due to industry advancements in technology and production, the brewery's constant facility expansion and the ever-growing market for beer in Wilmington. Stoeckle expanded the market for his porter and "Extra Fine" lager beer beyond the Delmarva peninsula and into Pennsylvania and surrounding areas. 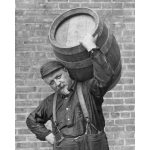 By 1893, the business represented about $250,000 in investments, employed 35 men and sold about 30,000 barrels of beer annually -- an increase of six times the amount produced just ten years before. Although the Diamond State Brewery would survive for many more years, the man who founded the company would not. On December 19, 1893, Joseph Stoeckle, one of Wilmington's most respected citizens and greatest brewer, died. His funeral proved a testament to his popularity and lifetime of good deeds, as it was one of the largest and most impressive in Delaware's history. In 1898, Wilmington honored Joseph's memory by dedicating a stretch of street near the brewery to him; it was renamed Stoeckle Street. Johanna Stoeckle, long a driving force behind her family's great fortune and success, assumed control of the brewery at the time of her husband's death. Eight years later, Mrs. Stoeckle died and the business passed into the hands of the five surviving Stoeckle children. They incorporated the business under the title, the Joseph Stoeckle Brewing Company, Inc. in 1891 and appointed Harry Stoeckle as president and general manager. Under Harry's guiding hand, the business prospered more than ever in the presence of stiff competition from other regional breweries and two local firms, Hartmann and Fehrenbach Brewing Company and the Bavarian Brewing Company. By the turn of the century, the Diamond State Brewery had increased production to about 1,000 barrels a week, employed about 50 hands and had further expanded its markets into New Jersey and Maryland. Business was brisk as usual through the first decade and a half of the 20th century for the Stoeckle brewery. At its peak, production topped out at about 100,000 barrels of beer per year. Certainly Harry Stoeckle's greatest professional and personal tragedy resulted from the enactment of National Prohibition on January 16, 1920. Like many in the liquor industry, Stoeckle severely underestimated the effects of the earlier temperance movement and continued to invest heavily in his brewery right up until 1919. When production of true beer was halted in 1920, Harry opted to keep the brewery in operation by producing 'near beer.' Those living near the brewery were said to have known when a batch of beer containing alcohol was ready for dealcoholizing. They would often finagle their way into the brewery to skim a few pails of the real stuff before it was processed. After Repeal of the Eighteenth Ameudment a premature attempt was made at reviving the old Diamond State Brewery by members of the Stoeckle family and several area businessmen. The New Jersey-Delaware Brewing Company was organized in 1933 but ultimately the operation never came to fruition. In late 1935 and into early 1936, the Diamond State Brewery, Inc. was formed as a stock company with Adolph G. Dangel, a long-time Stoeckle family friend, as president and Harry Wachtel as general manger. The elder Stoeckle family descendants, who still owned the brewery buildings, leased the 5th and Adams Street facility to the new brewing company. The new concern officially opened for business on December 18, 1936 with initial production scheduled at a modest 50,000 barrels. Because the post- Prohibition market was substantially reduced and increasingly dominated by colossal regional and national breweries, the operators of the new Diamond State Brewery reasoned that they could be successful directing their product to the small Wilmington market. This strategy worked quite well for a number of years. In an effort to identify with its past glory and play up the name recognition factor, the brewery began marketing Stoeckle Select Lager and Ale in the 1940s. They changed their corporate logo on bottle labels to the familiar King Gambrinus and their slogan became "A famous brew since '72" -- the year Joseph Stoeckle founded the brewery. On the heals of its initial success, the Diamond State Brewery, Inc. began an expansion program in 1947 that boosted the annual production capacity to 130,000 barrels a year. In 1949, Dangel became chairman of the board and was replaced as company president by Wachtel. The brewery's fortune began to change rapidly in the early 1950s. The realities of the market soon made it impossible for the small brewery to compete with the large nationals. Increasingly, regional breweries like Schmidt's and Esslinger, both of Philadelphia, and National Bohemian from Baltimore, stole valuable Delaware market share with expensive advertising and broader distribution channels. In early 1955, the Diamond State Brewery, Inc. -- the last of its kind still operating in Wilmington -- went bankrupt, closed and never reopened. Sadly, the failure of Wachtel and his counterparts also marked the beginning of the end for Stoeckle's old brewery. After serving as a futniture warehouse for a few years, the buildings were demolished in 1962 to make way for the Interstate 95 freeway through Wilmington. The city's two other major brewery buildings had already met a similar fate. Before the Diamond State Brewery was destroyed, the building's owner salvaged the King Gambrinus statue. Eventually the statue was sold to a suburban Wilmington restaurant owner, who displayed the familiar icon in front of his business. In August 1978, the zinc casting met its demise when it was carelessly dropped while being loaded onto a truck outside of a local junkyard. Although there were rumors that the statue was sent to Pennsylvania for repairs, it has not been located since. Gone was the last vestige of Joseph Stoeckle's one hundred year old brewery.